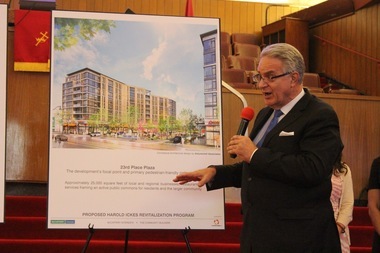 Developers unveiled their plans Thursday night for redeveloping the former CHA Ickes Homes. It’s been eight years since the CHA started demolishing Ickes, with the last families moving out of the development’s 1,006 units in 2010. A partnership led by McCaffery Interests with Community Builders and Antunovich Associates told a crowd at a 3rd Ward meeting Thursday night at Liberty Baptist Church in Bronzeville that it was planning a four-phase development with a mix of town homes, walk-ups and mid-rise apartments from 22nd Street to 25th Street on State Street on the Near South Side. Prudential Real Estate Investors is buying the Roosevelt Collection, a big South Loop retail-apartment complex whose ownership has tracked the recent boom-bust-boom cycle of the real estate market. Madison, N.J.-based Prudential has agreed to acquire the project at 150 W. Roosevelt Road from a joint venture led by Chicago developer Dan McCaffery, according to people familiar with the transaction. Separately, the McCaffery venture is selling a development parcel behind the Roosevelt Collection to Wood Partners, an Atlanta-based developer, these people say. It's unclear how much McCaffery and his partner, Los Angeles-based Canyon-Johnson Urban Funds, will clear in the sales. But it's safe to say the price will be a lot higher than the $160 million they paid for the Roosevelt Collection four years ago, when the real estate market was still in the early stages of recovering from the crash.